Proprietary "Smart Output Short Protection" without External Compensation /Filtering Capacities Needed. SF6020P is a high performance, highly integrated DCM (Discontinuous Conduction Mode) Primary Side Regulation (PSR) controller for offline small power converter applications. It can achieve less than ±4% CV/CC precision. SF6020P has built-in proprietary NC-Cap/PSR-IITM control for CV control, which eliminates external compensation or filtering capacitor. It has built-in cable drop compensation function, which can provide excellent CV performance. The IC uses Multi Mode Control to improve efficiency and reliability and to decrease audio noise energy @ light loadings. SF6020P integrates proprietary "Audio Noise Cancellation" control for audio noise free operation. The IC has built-in "Fast Dynamic Response" control to meet USB Charge requirements. 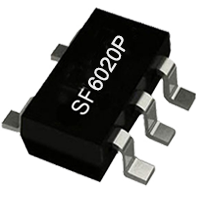 SF6020P also integrates proprietary "Zero-Output Startup" control to achieve startup when output is near zero voltage. The IC has proprietary "Smart Output Short Protection", which can protect the system with large leakage inductance when output is short circuit. SF6020P integrates functions and protections of FB Short Protection, Under Voltage Lockout (UVLO), VDD Over Voltage Protection (VDD OVP), Soft Start, Cycle-by-cycle Current Limiting (OCP), Pin Floating Protection, VDD Clamping. SF6020P is available in SOT23-5 package.